As you heard me say in this space last month, the preschool is proud to celebrate its 13th anniversary this year. This special birthday has provided us with an opportunity to reflect on where we've been and where we'd like to go in the future. 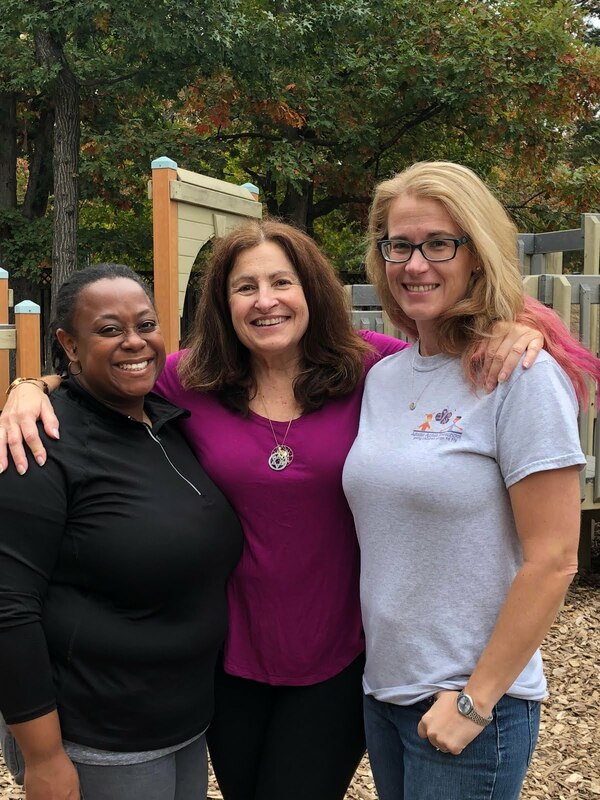 It's also the perfect time to introduce you to the preschool's incredibly talented, dedicated, and professional teaching staff, and to share with you some of what goes on in our classrooms every day. Morah Virginia and Morah Traci teach Kitah Adom, often with the help of Morah Shonda, one of our floaters (teachers who float between classrooms and substitute when necessary). Morah Virginia has been teaching two-year-olds for 16 years, and she's been with Agudas for six of those years. Before she was a preschool teacher, she was a lawyer, at one point working on Capitol Hill. She says she prefers working with two-year-olds to anybody else. She has two daughters in their 20s, one of whom works at the preschool, too. Morah Traci received her B.A. in Biology from Mount Holyoke College in 1995. She has two boys, the younger of whom attended Agudas Achim Preschool. She's been working at the preschool for four and a half years and is looking into completing a Child Development Associate credential (CDA) sometime in the next year or two. Morah Shonda has been with the preschool for seven years. She's also an Alexandria City Public Schools bus driver in the early mornings and afternoons; as a result, she occasionally sees some of our graduates on field trips, thought they can't always remember why she looks familiar! Her daughter graduated from TC Williams last year. Kitah Adom begins every day on our playground or social hall. This makes the transition at drop-off a little easier for our youngest ones to handle. The teachers engage with the children the moment they arrive. They encourage the children to use their big muscles to climb, run, and dig. They talk with them constantly, observing the world around them, introducing them to new vocabulary and new concepts at the same time. They play. They pretend. They find bugs. And they eat snack outside whenever possible. Once they return to the classroom, it's snack time followed by a short circle time. After that, it's time to get messy. The Kitah Adom teachers are not afraid of paint or big projects. One of my favorites was the dreidel they created as a group last year. The ten children were seated at two tables, and on each was large piece of poster board. One teacher squirted a little red and blue paint on each one while the other passed out paint brushes. Very carefully the children began drawing their brushes across the poster board. After a minute, one child experimented by turning their brush upside down and dragging it across the page, creating a clean line in the process. They teachers seized the opportunity and encouraged all the children to do the same. It wasn't long before another child gingerly used their finger to draw in the paint. After saying, "What a good idea! Let's all use our fingers!" the teachers collected the paint brushes. Soon, the children were using both hands to smear the paint over the paper, which at this point had become a lovely purple. Some were covered up to their elbows. Finally, the teachers added glitter to the mix, which created a whole new feel to the paint. Not a single child shied away from getting gritty and sticky. This ended up being a full-body sensory experience as well as a collaborative art project. The children found new ways to use the tools and materials they'd been given, and the teachers took advantage of that enthusiasm, which led to even more experimentation and more creativity. After the paint dried, the teachers cut out large dreidel shapes, stapled them back to back, and stuffed the insides with newspaper. A lovely 3-D dreidel hung in the classroom for the rest of the year, a memory of a great day.